MaxiNutrition, previously MaxiMuscle are multi award-winning and the number 1 European suppliers of sports nutrition. They boast a 4 star review on Trust Pilot and are sponsors of some of Europe’s top athletes including British boxers Amir Khan and Anthony Ogogo, England rugby captain’s Chris Robshaw, and Welsh rugby player George North. MaxiNutrition products are held to strict testing standards to ensure they meet all safety requirements as well as the needs and desires of their customers. This voucher code deal is for service men, ex-forces family and friends bookmark this page and maximise your savings! A BIG thank you for your service! 1. Click ´Get Code´ to get the voucher code and open the MaxiNutrition web site. 3. Enter the code at checkout and enjoy 25% off your purchase! MaxiShop is an online retailer for Europe’s leading sports nutrition supplier MaxiNutritions. At MaxiShop you can find all of the supplements you need if you are just trying to get in shape or a seasoned athlete. They have several lines of products to meet all of your supplement needs including their maxi nutrition line, maxitone, maxifuel, and maxiraw. Maxi nutrition was created to build muscle. Maxitone is their women’s line of products created to help tone and sculpt your muscles, and lose weight. Maxifuel is a made up of a full line of energy boosters to get you through the day or help you power through a tough workout. Maxiraw is a line of the purest supplements available, such as their pure whey protein isolate which is 90 percent protein to help you regenerate fast. Maxishop allows you to shop by your chosen sport to find the exact products you need to build muscle, speed, or endurance based on your needs as an athlete. Use this MaxiNutrition voucher code now! 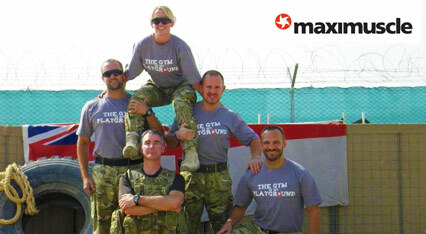 Please contact MaxiNutrition for more information on their 25% Military / Armed Forces discount.